On Saturday North Carolina CZT Nancy Newlin shared String 104 with us and today’s she’s back with Jajazz. I think we were overdue for another grid-based tangle pattern. 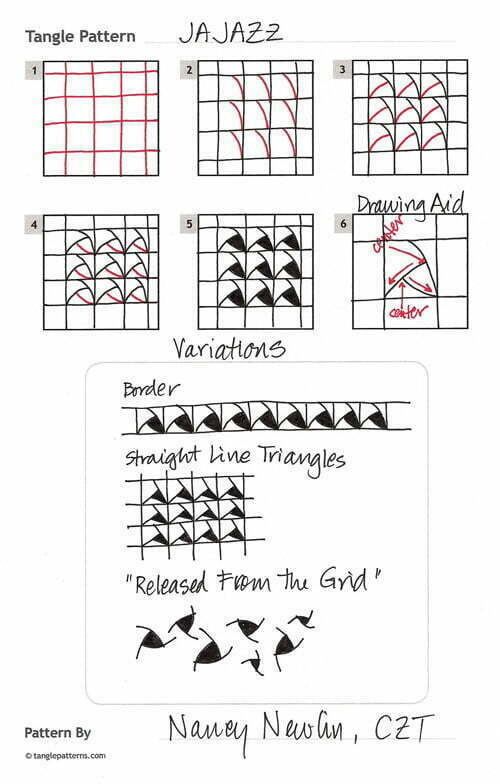 For my example I reversed rows of Jajazz in sets and added a bit of shading along one axis of the grid lines. Here Nancy demonstrates the step-by-step instructions for drawing Jajazz. She also includes a drawing aid illustrating that the lines come from the center point of the previous line. She also shows a variation drawn with straight lines instead of the original curved ones and a “released from the grid” version of the motif. Check out the tag nancyn for more of Nancy’s patterns on TanglePatterns.com. Very nice Tangle! I love the variation, it almost looks like a dance. Thank you for sharing! I really like this one. It’s simple, but can offer a lot of dimension. Good job! Joyce in Montana – Thankyou Nancy, for the neat, neat, pattern. I already have plans to use it on something I am looking for a new tangle on. Keep them coming. Love yours. Marie Starefoss – Very Nice tangle I like to drawing it. I draw one tangle Evry day. and I love it. Bunny Wright – This is a great tangle. There are so many variations. It’s fun and inspiring too! Thanks! I like this – am planning a name tangle for a friend and I think this will be great.